LEXINGTON, Ky. (Monday, January 4, 2016) – The National Thoroughbred Racing Association (NTRA), Daily Racing Form, and the National Turf Writers and Broadcasters (NTWAB) announced today that Mary Simon of Daily Racing Form has won the 2015 Media Eclipse Award in the Audio/Multi-Media and Internet category for “Regret’s Derby at 100: Filly Made a Case for Equality,” which explored the impact of the first filly to win the Kentucky Derby during a period of great upheaval in America with impending world war and the struggle of women to earn the right to vote. The honor will be presented to Simon, who has now won three Eclipse Awards, at the 45th Annual Eclipse Awards dinner and ceremony on Saturday, January 16, at Gulfstream Park Racing & Casino in Hallandale Beach, Fla. The Eclipse Awards are presented by Daily Racing Form, Breeders’ Cup, and The Stronach Group, and produced by the NTRA. 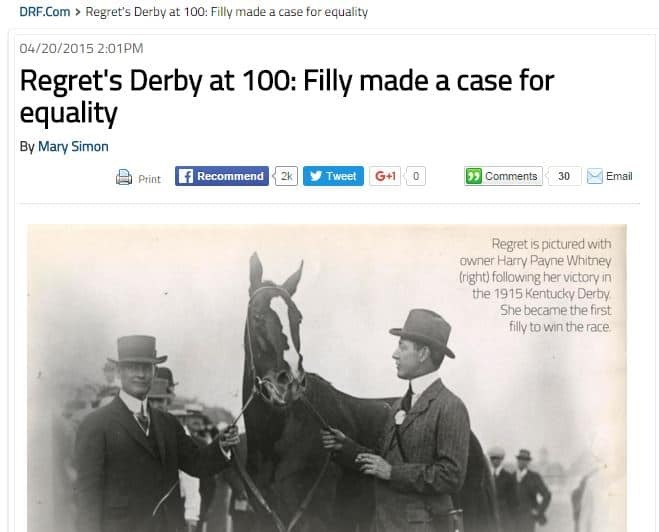 With text written and extensively researched by Simon, “Regret’s Derby at 100” offered a retrospective of a strapping filly, owned by New York scion Harry Payne Whitney, becoming the first female to win the Kentucky Derby, a race that had to that point been mostly a regional event. Trained by future Hall of Famer James Rowe Sr., Regret was undefeated as a two-year-old, defeating male rivals in all of her races. Following Regret’s triumph in the 1915 “Run for the Roses,” Whitney called the Derby “the greatest race of all,” and gave it instant credibility. Throughout the piece, supported by 100 year-old photographs, newspaper headlines, and race videos – including extraordinary footage of British suffragette Emily Davison taking her own life by jumping in front of the King’s horse in the 1913 Epsom Derby – Simon weaves into the narrative the tumultuous times and a confluence of events of the day, starting on the eve of the 1915 Derby when the passenger ship Lusitania was sunk by a German U-boat, with Whitney’s brother-in-law, Alfred Gwynne Vanderbilt, perishing among the 1,959 people aboard, and laid a foundation for America’s entry in the First World War. The women’s suffrage movement is an important theme throughout the story, as at the start of 1915 when a bill granting women the right to vote failed to pass in the U.S. House of Representatives by 204-174. The failure to pass was like “pouring fuel onto an already raging fire” and a determined effort was made over the next five years for women to gain the right to vote, which was achieved with the passage of the 19th Amendment. Simon credits her husband, Mark Simon, the DRF Breeding editor, and former DRF editorial director, with the impetus for the story. Joining him among the Daily Racing Form collaborators for the entry were Jody Swavy, editor-in-chief; Jim Sewastynowicz, photo editor; and Matt Brennan, senior producer of Digital. Simon, who was born in Upland, Calif., where she rode and bred horses growing up, has now won Eclipse Awards in three different categories – first in 2000 for feature writing in Thoroughbred Times and in 2012 for News-Enterprise, again in Thoroughbred Times, on medication in racing. The winning entry may be viewed here: http://www.drf.com/news/regret. Honorable mention in the Audio/Multi-Media and Internet category went to Sirius XM radio for “Allen Jerkens Remembered,” produced by Steve Byk, which aired on March 15, 2015, and to Thoroughbred Daily News for “The Education of Bobby Flay,” written by Lucas Marquardt, which appeared on the TDN website on October 28, 2015. Judges in this category were Jessica Chapel of BreedersCup.com; Joe Withee, Director of Broadcast Publicity for Emerald Downs; and Amy Zimmerman, Vice President, Business Coordination & Director of Broadcasting, Santa Anita Park.